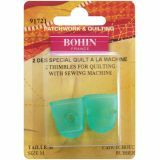 Rubber Fingertips - BOHIN-Quilting Finger Cots. Flexible, rubber finger cots ideal for quilting with a sewing machine. The rubber allows you to guide your fabric even more accurately. The opened top allows long fingernails through. This package contains two size medium finger cots. Imported.